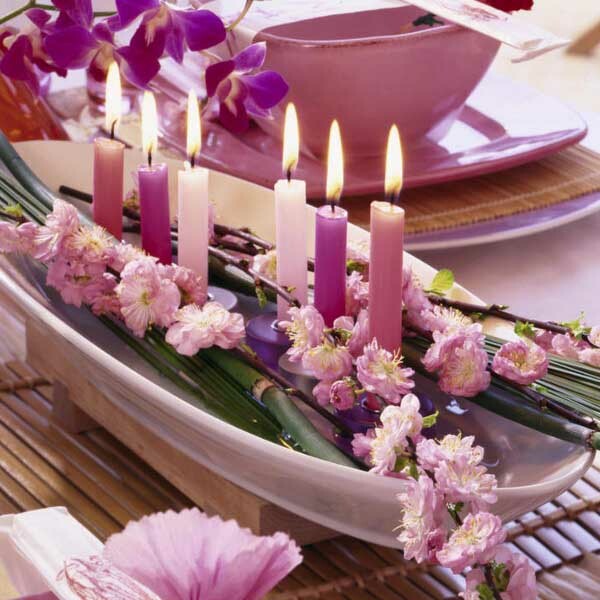 Made with pink, purple and red candles centerpieces are warm and tender. 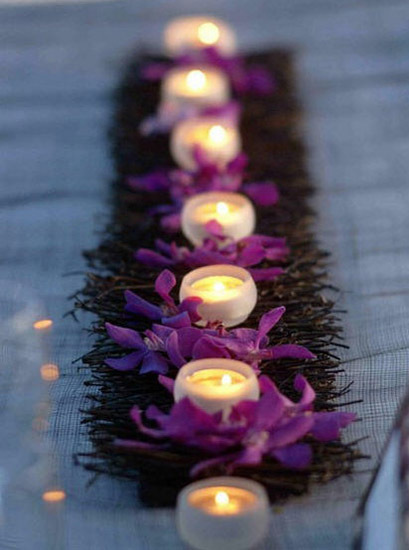 Candles are simple and elegant table decorations that create a special atmosphere. Candles, combined with flowers, make gorgeous table centerpieces for elegant and romantic table decoration on Valentines Day. Made with flowers, heart decorations and candles, centerpieces dramatically transform dining table decor, bringing the warmth and intrigue with glowing light and reflections into the dining room. Candles centerpieces are perfect decorating ideas for Valentines Day and special occasions that add mystery and warmth to holiday table decor. Large or small tea light candles make the space cozy and relaxing. Flowers and candles centerpieces symbolize romance, making your loved ones feel very special. 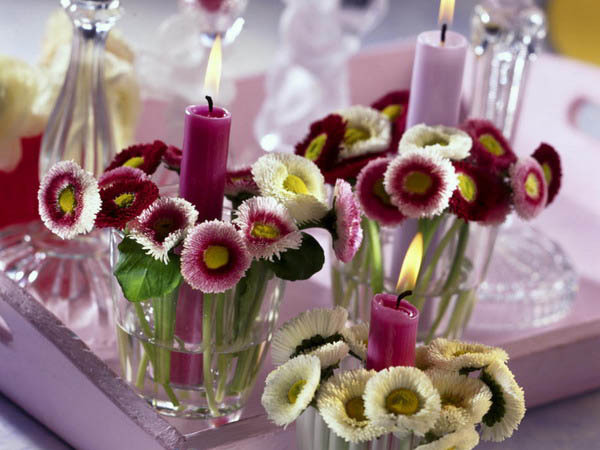 White or pink, purple or red candles centerpieces are excellent ideas for Valentines Day table decor. 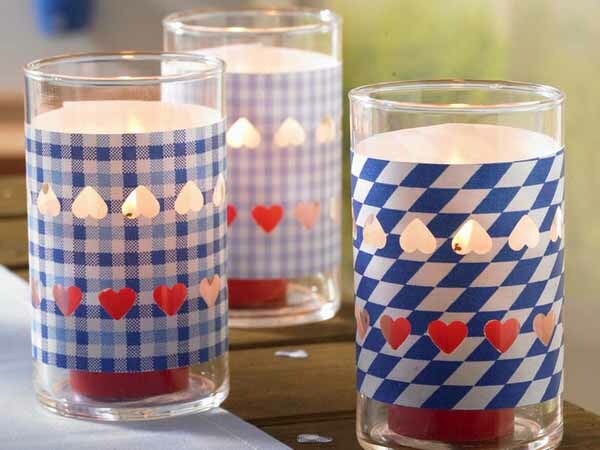 Inexpensive and easy to make, candles centerpieces create luxurious and charming dining table decoration, adding symbolic color to Valentines Day celebration. Heart decorations and crystal glasses, glass bowls filled with water and flowers or glass candle holders increase the effect even more. Fresh flowers and creative food presentation, tasty meals and sweet treats fill the dining room with aroma, celebrating love and happiness on Valentines Day. 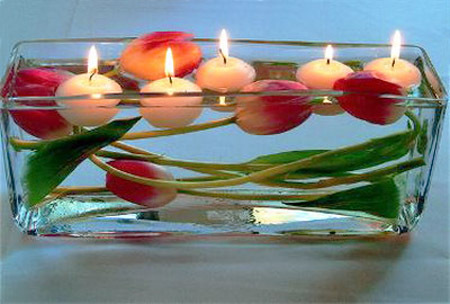 Few ordinary candles in glass candle holders, glass vases or bowls, filled with water and decorated with floating flowers, become dramatic candles centerpieces for unique and creative, charming and romantic holiday table decor. White, pink, purple and red color combination look bright and lovely for simple and meaningful hearts decorations. Fresh flower bouquet and white, pink, purple and red color combination are excellent choices for romantic table decorating ideas on Valentines Day. Small beach pebbles and glass beads, lace and paper, driftwood pieces and decorative fabrics in white, pink, purple and red colors can be used for designing unique candles centerpieces and table decorating ideas for Valentines Day. 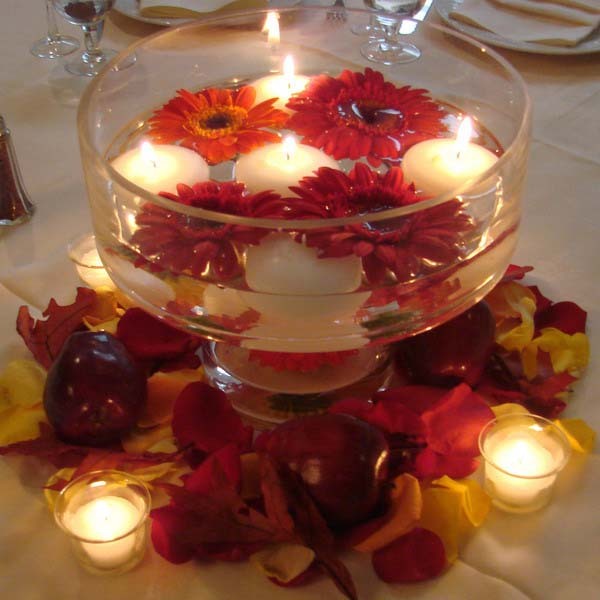 Floating in the water fruits and fresh flower petals, combined with tea light candles, look beautiful, offering romantic holiday table centerpieces that add charm and mystery, coziness and warmth to table decor.